Iowa City – Take a step outside and what do you smell? You could get a whiff of a hopeless romantic on this Valentine’s Day. Maybe you get a false hint of Spring with this unusually warm February weather, but either way one thing is certain and that is, baseball, is in the air. 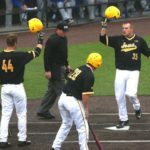 With pitchers and catchers reporting to their respective training camps to prepare for the Major League season this week, Iowa baseball also had their media day this past week as they prepare for the upcoming season. “Our culture is really strong and really good.” Hawkeye Head Coach Rick Heller said to the media on Friday. A strong culture is definitely what Coach Heller has developed in his three years as the Hawkeyes head coach posting a 101-67 record during that span. One thing that Coach Heller has often turned to, to lead his team are seniors, and pitching. This year, he definitely has one of them. When you look at the Iowa roster, you will see many names you haven’t seen before. That’s because this Iowa team hosts twenty-two new players. “Our captains have done an amazing job. Guys like Corbin Woods, Mason McCoy, Josh Martsching, and C.J. 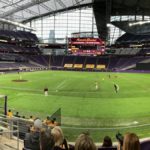 Eldred did a nice job setting the tone with this team and not letting the culture go backward.” Hawkeye athletic teams are not shy about demanding leadership from their seniors, but will this year’s crop be enough? Coach Heller is, “worried” about having so many new faces on the roster this year but Coach Heller, “feels good about the makeup of the team.” While this team might not have as much senior leadership as they are accustomed to, they definitely won’t be lacking in pitching. The 2017 Hawkeye’s return 10 pitchers from last year’s pitching staff; A staff that posted an outstanding 3.54 combined ERA (second best in school history), a staff that also set a school-record with 382 strikeouts. While having 22 new faces to a team can be scary, it can also add some real depth. Adding to this impressive pitching rotation are a few new faces in its own including: two players named in Perfect Games top 500, an All-Conference Honorable mention transfer, and as well as a one of the “top prospects in the nation” according to The Scouting News. One of those players to keep an eye on is Freshman Cole Pennock. Pennock is joining the team from Clinton High School in Clinton, Iowa. Pennock was one of the players ranked in the top-500 and the prospect The Scouting News deemed as one of the best. Another player to look out for this year is Kole Kampen. Kampen is another freshman joining the team from Fort Dodge, Iowa. Kempen was the other new Hawkeye addition added from the top-500 and in 2015, his senior year in high school, Kampen was named to the first-team all-state by IHSBCA. The third addition to remember is Nick Nelsen. Nelson is a transfer student from Johnson County (Kan.) Community College. Last year for the Cavaliers, Nelson went 5-1 with a 2.36 era and was an Honorable mention for the all-conference team. “We have had good pitching the last three years and we feel this staff might be the deepest from top to bottom” Coach Heller said. It’s no secret that defense and pitching wins baseball championships. 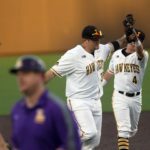 The Hawkeyes will start the season on the road as they face South Florida in a three game series starting this Friday, February 17th.